RICK'S COMPUTERS, INC. has been an Acer Computer reseller since 1994. We offer full service, support and sales of many Acer products. From consumer and business desktop and tower units, to laptops and LCD displays, we have a solution that's right for you -- many with a standard 3 year warranty. 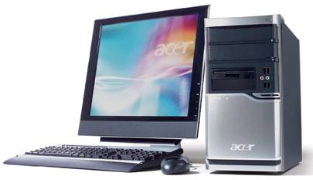 If you would like to compare some of the products that Acer has to offer, we periodically generate some tables with many of the products specifications. Click on a category below to see more information. Call us at 712-893-2444 for information or a quote.